A court in China’s southern Hunan province Monday put Taiwanese rights activist Lee Ming-che, alongside a Chinese national Peng Yuhua, on trial, in which both pleaded guilty to charges of inciting state subversion. But analysts outside China denounced it as “a farce” or “another show trial,” saying Hunan’s court hearing has highlighted nothing but a huge discrepancy in the level of democratization and rule of law between Taiwan and China. They demanded Chinese authorities to immediately set Lee free while the Chinese court wrapped up its four-hour-long hearing on Monday by announcing it would reach a verdict on a later date. According to video clips posted on the court’s official Weibo account for public viewing, prosecutors in the city of Yueyang accused Peng and Lee of having organized discussion groups on social media platforms including QQ, Wechat and Facebook since 2012 to advocate for a democratic multi-party system and free elections in China in a bid to attempt to oust the ruling Communist Party. Prosecutors argued both have violated Criminal Law Article 105, under which they may be subject to a sentence of three to 10 years or more than 10 years if they are concluded to be the principle culprit behind the subversion scheme. Peng, 37, was said to be the main initiator, who established the group and organized private gatherings to discuss the political pursuit for a multi-party system, while Lee, 42, worked as a manager in charge of personnel training. Prosecutors described Lee’s comments online as highly critical of the Chinese government and its socialist political regime while endorsing Western political and democratic values. In response to the prosecutors’ accusations, both Peng and Lee openly pleaded guilty and showed remorse in court. Peng said he regretted his past ignorance. “My criminal act had made a negative impact on the society with an adverse consequence. And I’ve deeply hurt my family. I now truly regret it,” he told the court. Lee said that his political understanding about China was misguided by some Taiwanese media, which are unfriendly to China. “My past ideological thoughts and knowledge [about China] are incorrect, from which, I’ve committed these crimes. I now plead guilty and confess,” Lee told the court, where his mother and wife were also present. 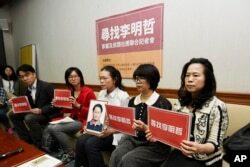 FILE - In this photo taken March 24, 2017, Lee Ching-yu, third from right holds up a photo of her missing husband and Taiwanese pro-democracy activist Lee Ming-che during a press conference. Lee’s wife previously predicted her husband would be forced to plead guilty in court in exchange for his freedom or a lenient sentence. She has long argued China has illegally arrested and disappeared Lee, formerly a journalist and a human rights activist, for almost six months, during which he was deprived of rights to defend for himself. But Zhu Songling, a professor of Taiwan Studies in Beijing Union University, disagreed. “Only Lee himself can say if he was coerced to confess. No one can speak on behalf of him. Don’t interfere with the suspect’s own will and free expression. That would be a violation of his personal freedom,” Zhu told VOA. The professor praised Monday’s trial as transparent and lawful, which sent a message to all nationals including those in Taiwan to abide by the country’s related national security laws. But analysts outside China insisted Lee isn’t guilty. In a free and democratic society, Lee enjoys every right to freely express his political thoughts, said fellow Taiwanese rights activist Xiao Yiming, who described Lee as a “prisoner of conscience” in China. Tseng Chien-yuan, an associate professor at Chung Hua University in Taiwan, also argued only a few totalitarian regimes in the world will put prisoners of conscience behind bars. “[It’s unbelievable] that those who advocate a democratic multi-party system would be seen as [traitors]. Only authoritarian regimes in the world still enforce such laws,” Tseng said. “China may have put on a legal show. But to the world, it was a farce to showcase [how outdated] China’s implementation of rule of law,” the professor said. In accordance with international laws, China shouldn’t have had put Lee on trial as he is a national from Taiwan, and certainly shares different political ideology, the professor said. Beijing sees Taiwan as a renege territory, although the People's Republic of China has never ruled the island. In a written statement, the ruling Democratic Progressive Party in Taiwan accused China of having wrongly put Lee on trial for national security reasons as he has long been a non-government organization worker who has devoted himself to the pursuit of universal values, including democracy and human rights. Many pro-democracy activists in Hong Kong also threw their support behind Lee, organizing a street parade on Monday afternoon to call on Chinese authorities to free Lee and many other prisoners of conscience in China.